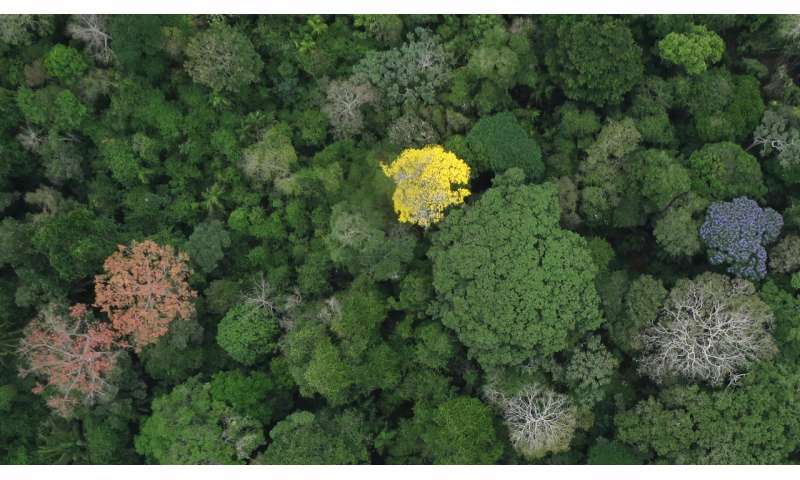 In this photo of the tropical rain forest canopy in Panama, Handroanthus guayacan, the focus of a new Brown/UCLA study, blooms in yellow while Jacaranda copaia has blue flowers and Cavanillesia plantanifolia has pink fruit. Taking advantage of regular annual changes, like flowering and fruiting, allowed Brown ecologist Jim Kellner to track individual trees through time and map distributions of some species throughout a large area. Credit: Jonathan Dandois and Helene Muller-Landau/Smithsonian Tropical Research Institute. "There are more tree species living in an area not much larger than a few football fields in Panama than in all of North America north of Mexico combined," said Jim Kellner, first author on the paper and an assistant professor of ecology and evolutionary biology at Brown. "How this diversity originated, and why it persists over time is a paradox that has challenged naturalists for more than a century." "The take-home of the study is that there is a 'negative feedback' on population growth," Kellner said, which puts the brakes on population growth in locations where the species is common. Earlier studies have shown that this negative feedback phenomenon holds true among young trees—seeds, seedlings and saplings—but ecologists hadn't been able to determine whether it influences adult trees, the reproductive portion of populations, he said. "It takes decades for trees to become reproductive in tropical forests, and the problem is compounded by how rare each species is," Kellner said. "We found that for this species, you would have to search about 250 acres to find one new adult tree every year." That challenge isn't feasible on foot, but remote sensing can overcome the challenges of observing large areas. "By timing the satellite image acquisition with seasonal flowering, we were able to identify most of the adults for this species on the island," said Kellner. "I can't think of any idea in ecology that is more important than population dynamics," he said. "It's important for everything from fishing licenses to forecasting disease outbreaks." The research was published on Monday, Oct. 15, in the Proceedings of the National Academy of Sciences.